Flame resistant fabrics are textiles possessing flame resistance properties is used to manufacture apparels, furnishing and garments for application in industries such as oil & gas, construction and infrastructure, mining, military and chemical for protecting labors working in these industries. These fabrics are used as fire barriers, it is manufactured as protective clothing to offer protection and safety to workers from direct and indirect exposure to fire and electric arc. Flame resistant fabrics are textiles that consist better fire-retardant properties in comparison of other fabrics due to its chemically treated fireproof fabrics which is primarily produced from synthetic fibers and natural fibers. Synthetic fibers involve raw material such as aramid, polyester and acrylic whereas natural fibers comprise of cotton, wool and silk. Growing demand for flame resistant fabric is primarily due to stringent industries regulations which regulates workers protection norms and maintains safety at workplace, is driving the overall flame resistant fabric market. Notably, the rising demand from oil and gas, military, and constructution industry in most of the developing nations of Asia Pacific will augment growth over the forecast timeframe. High cost of production and huge investment for R&D is ristricting the global flame resistant fabric market. Implementation of new equipment and technologies as well as heavy maintenance cost is challenging the investors and manufactures of the flame resistant fabric market. However, the high R&D cost for developing innovative technologies will negatively affect the market, hindering the growth. Raw material such as polyester and acrylic are significantly used for producing fabric, fluctuation in the prices of raw material due to variation in crude oil prices are hindering market growth. Further, from past few years, the prices of silk and wool is also rising which are used in fabric manufacturing process, will decelerate growth. Though, new technologies and better technique can reduce the cost of raw material, as they will efficiently grow the market over coming years. Among all the product types, inherent is highly consumed product, while hybrid fabrics witnessing fastest growth in the segment which is likely to grow the flame resistant fabric market share over the forecaste timeframe. The inherent products are highly used fabric owing to its permanent and inseparable characteristic of never losing fire resistance properties even after several years. Thus, it can be applied to various end-user industries owing to its durable properties, demand for this product segment is likely to rise over forecasted timeframe. Hybrid fabrics products are manufactured by combination of different fibers such as aramid yarns and carbon fiber. This segment is one of the fasted growing product segment due to its light weight, striking patterns, cost efficient and high impact resistance. The transportation segment is increasing in terms of consumption volume in flame resistant fabric market, while the industrial segment is fastest growing segment regarding market revenue. Due to growing automotive industry and government initiative, the consumption in transportation sector is rising over defense and public services. Further industrial sector is fastest growing segment owing to rising demand from construction & infrastructure industries. Asia Pacific is the fastest growing and contributes a major share to the global flame resistant fabrics market over the forecast period. Followed by Asia Pacific, Latin America is found to be the second fastest growing region regarding market revenue. 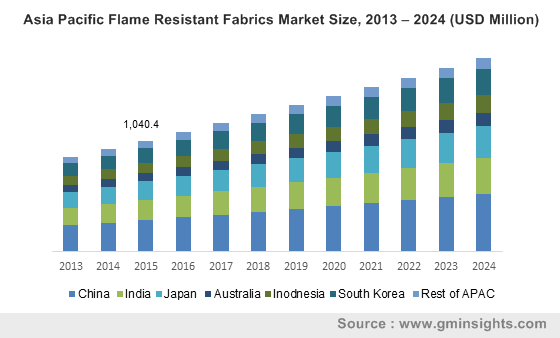 Growing industrialization and rapid urbanization in emerging economies of Asia Pacific will facilitate the growth of flame resistant fabric market in coming years. 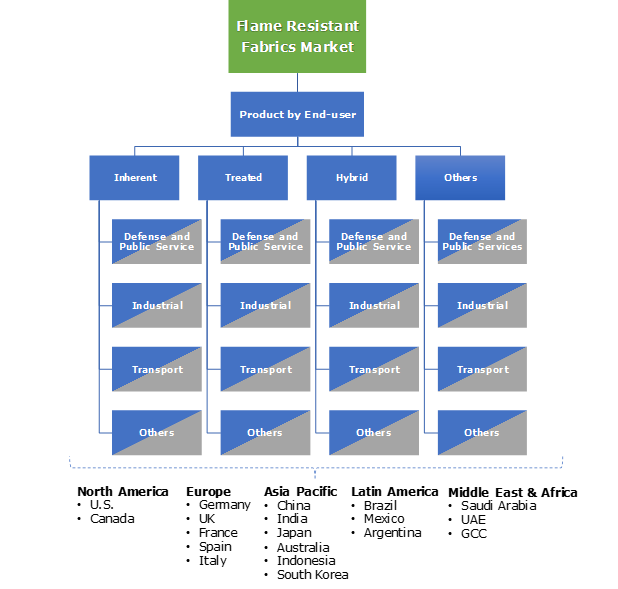 Leading players operating in the global flame resistant fabric market include DuPont, Milliken & Company, Huntsman International LLC, LENZING AG, Evonik Industries AG., Solvay and TOYOBO CO., LTD. In the global flame-resistant fabric market, the companies mentioned above have unique products which are used in various industrial applications. Flame resistant fabrics are synthetic fiber derived from a combination of both polyester, chemical and cotton. The global flame resistant fabric market is determined to be attractive, as this market contains many large-scale industrial players. Government initiative towards labors protection and safe working place to reduce the risk of accident will further augment the product demand, and enhance the application of product in various end-user industries.